Drawn in 1835, this sheet is to date the first documented design for Schnorr's encaustic fresco dedicated to the victory of Charlemagne over the Saxons at Fritzlar, which decorated the East wall in the Room of Charlemagne; the first of the famous 'Emperor's Rooms' in the Festsaalbau of the Residenz in Munich, planned and built by the court architect Leo von Klenze. In 1835 Schnorr was commissioned by King Ludwig I of Bavaria for the decoration of the walls of three major rooms of the Festsaalbau. The instructions were very clear: the artist was to sing a paean to the King through the celebration of the lives of the emperors Charlemagne, Barbarossa and Rudolf von Habsburg. The present work allows us to date the preliminary drawings for the room dedicated to Charlemagne to 1835, the year Ludvig commissioned Schnorr for the project. All the other known sheets, designs and bozzetti for the Charlemagne Room bear the date 1839. This design was the model for the final sequence 'The Victory of Charlemagne over the Saxons', executed in 1842. The encaustic frescoes were finished in September 1842. 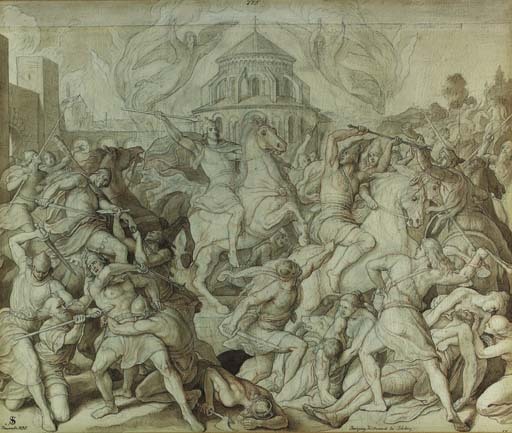 Besiegung Wittekinds bei Bürberg shows Charlesmagne's decisive battle against the Saxons, in front of the church of Bürberg. According to the legend, the church, threatened by fire, was saved by two angels in bright white garments, symmetrically framing the chapel's dome at the top of the composition. The philological importance of the work, as well as its extraordinary freshness of execution, make it an important discovery, and a seminal addition to Schnorr's corpus. We are grateful to Dr Hinrich Sieveking for his assistance is cataloguing the present work.